Last Sunday I sang the praises of John Singer Sargent and the current show, Sargent’s Youthful Genius: Paintings from the Clark, at the Amon Carter Museum in Fort Worth. The little bird, in the photo above, perched on the street sign was also singing. 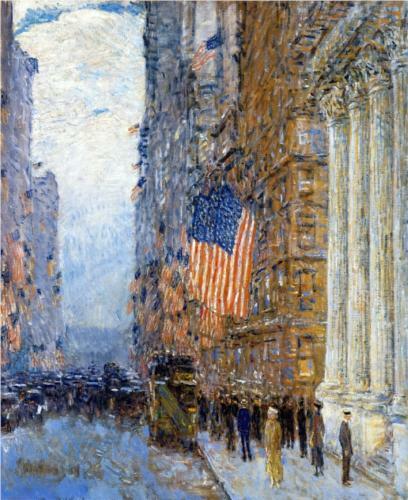 The American artist, Childe Hassam, was cited in my art history books and lectures for his prolific output of urban and coastal scenes – 3,000 over the course of his life – and, more importantly, for his adoption of the Impressionism style. Among American collectors, dealers and museums in the early 20th century, Hassam was instrumental in popularizing the softer pastel color palette and free staccato brushstrokes being used by the European Impressionists. When you visit, also look for excellent paintings by artists among the greats like Winslow Homer, Mary Cassatt and Georgia O’Keefe. 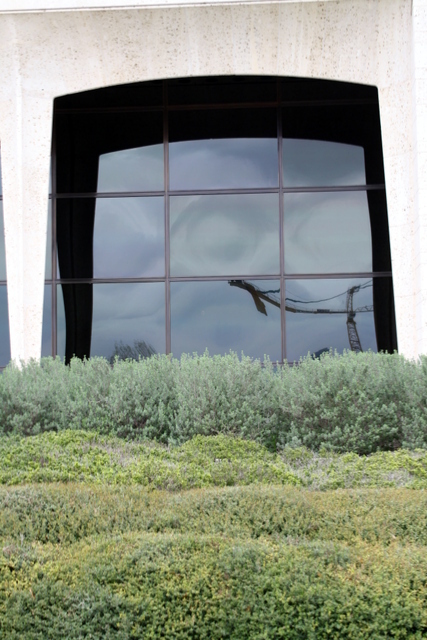 Above is a section of the “front porch” (or loggia) entrance to the Amon Carter Museum. Philip Johnson’s design specified that all the arches and columns were constructed using Texas shell-limestone. Johnson took several trips to Leander, TX. quarries before finding the right cream-colored stone. The building itself has an interesting story. New York-based architect, Philip Johnson, was hired to design what became the first modern museum in Fort Worth – finished in 1961, with the Kimball (1972) by Louis Kahn and The Modern (2002) by Tadao Ando to follow nearby. 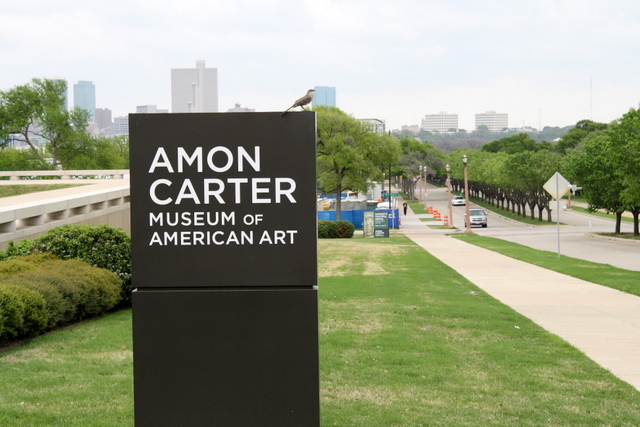 Propped on a hill overlooking downtown Fort Worth, the International Style of the Amon Carter was noticed by the inner art and architecture circles on the East Coast. Welcomed murmurs were heard about the sophisticated tastes existing in “Cowtown” and Texas. Next weekend, I’ll be touring the visual art scene in Austin with Jed Morse, Curator at Nasher Sculpture Center, and a group from the Nasher’s Avant-Garde Society. My prediction: I’ll have many topics and photos to share with you in two weeks. John Singer Sargent is on my Top Ten List of best painters who ever lived. 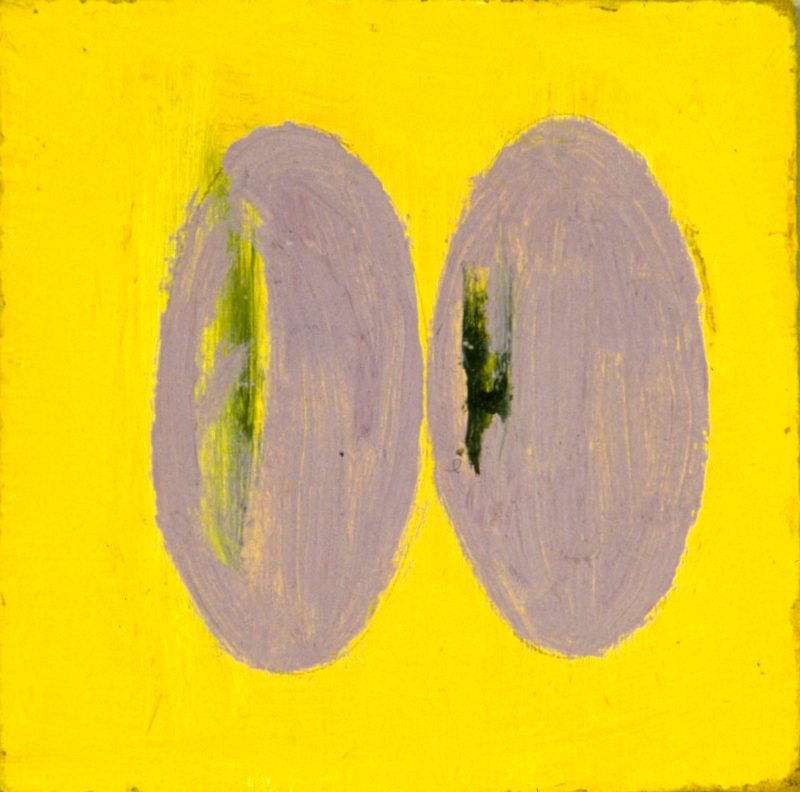 The Clark Art Institute has lent four of his paintings to the Amon Carter Museum in Fort Worth. One of them – “Fumée d’Ambres Gris” (1880) – is among my Sargent favorites. Why is he in my pantheon? One reason is his masterful handling of paint. As seen in “Fumée” (refer to image below), Sargent manipulates the color white in a way that every studio art teacher can use as a textbook example of how to handle white. There is no color white in nature; it exists only in a can or tube of manufactured paint. And, every beginner painter (myself included) automatically uses it straight from the tube; and, thus fails to capture the essence of sunlight or the subtle recesses of a distant wall. 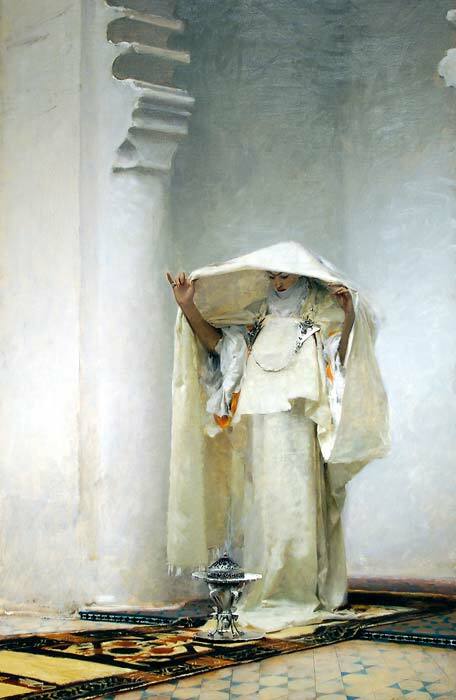 From Sargent we learn a trade secret: mix white with other colors to capture on canvas what you see in life. To imitate sunlight, a touch of orange is the secret. To render a remote corner, violet grey is the solution. “Fumée“is basically a monochromatic painting, but on examination you rarely see white “straight” from the tube. Here are a few other reasons, which are evident in “Fumée,” that I greatly admire Sargent. His compositions are cropped, a device that was modern for his time. He was innovative in his choice of subject matter, using travels to exotic locales for ideas. The North African woman inhaling vapors in “Fumée” was an image from a trip to Tangier. Fumée d’Ambre Gris (1880) | Artist: John Singer Sargent | Clark Art Institute | Purchased in 1914 by Sterling Clark for $5,000. 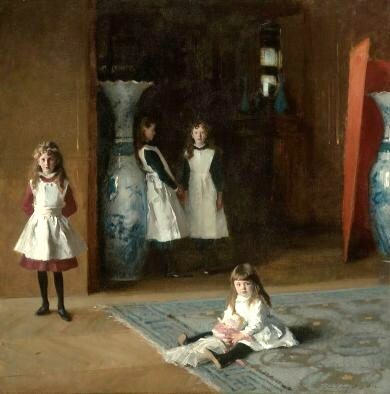 Since I’ve opened and shared my art voting book, my number one favorite Sargent painting is “The Daughters of Edward Darley Boit,” which is on permanent display at the Museum of Fine Arts, Boston (MFA). I remember being fortunate my senior year of college when I was selected to intern at the MFA. I’d take breaks and “visit” this painting – simply staring firsthand at the masterpiece that I had seen in an Art History slide lecture. 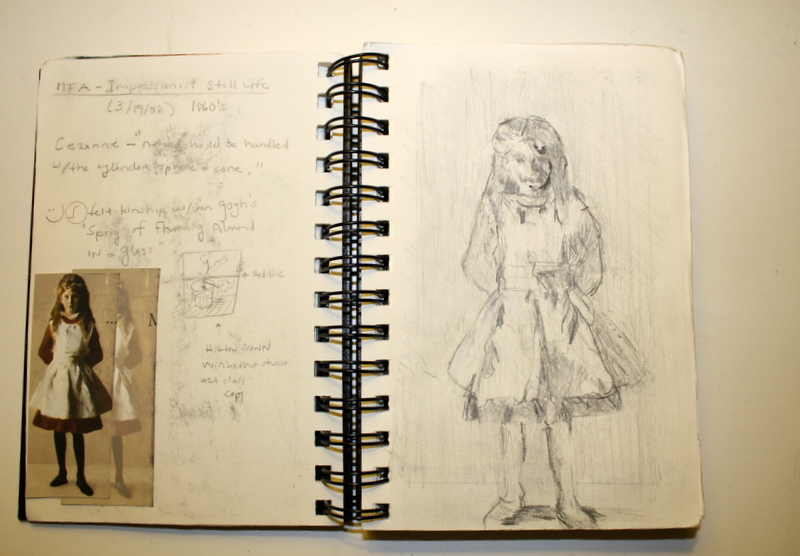 Decades later I lived in the Boston area and would again sit on the same wooden bench before the sisters and sketch as a way to practice drawing and linger with Sargent. The study below is of eight-year old Maria Louisa (the sister in the left most corner). Of note, the Boit heirs gave the MFA the six-foot-tall, blue-and-white vases you see in the painting. They now flank this nearly life-size (87-3/8” x 87-5/8”) group portrait. The Daughters of Edward Darley Boit (1882) | Artist: John Singer Sargent | Museum of Fine Arts, Boston | The portrait captures the (almost too) well-mannered sisters. If you are a Sargent fan or simply like looking at an excellent painter’s work, I recommend the drive to Fort Worth. “Sargent’s Youthful Genius” is open through June 17th, as is “The Age of Impressionism: Great French Paintings from the Clark” across the street at the Kimball Art Museum. Last night we reset our clocks and remembered the ditty, “Spring forward. Fall back.” For me, spring is about going forward, renewals and becoming more alert, after a semi-slumber in the coldness of winter. Each year just before I adjust my clocks, I start to notice birds chirping earlier and louder in the mornings. It’s time to admire the daffodils blooming around Dallas and in my yard. 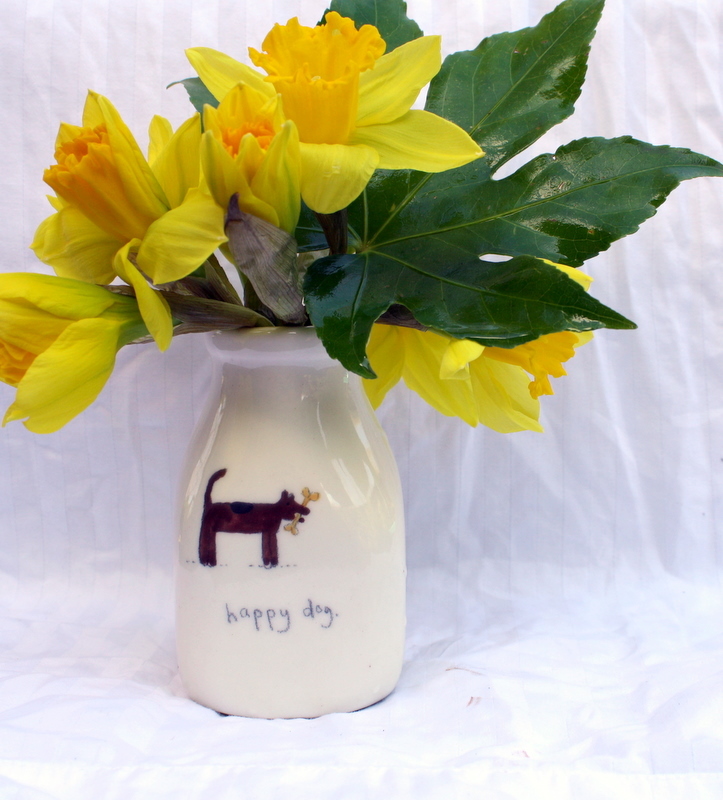 One of my Spring season rituals is to fill a vase inscribed with “Happy Dog” (a message that captures how I feel when daylight savings happens) with these bright yellow flowers. 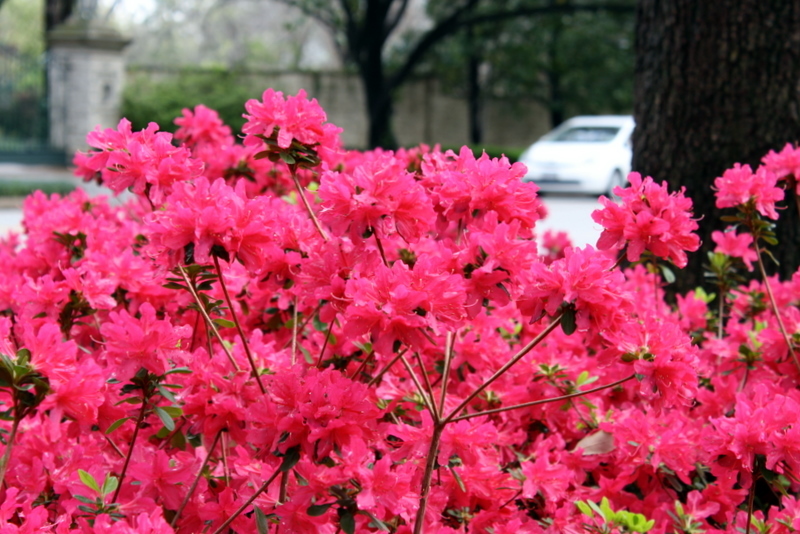 Even though the azaleas blossom along Preston Road every spring, the pop of fuchsia always surprises me when it first starts. For all of my friends who live in Dallas and haven’t yet taken this route recently, the bushes just started their show. Spring is also a time when my creativity flows more effortlessly. (Side note: I suspect I was a grizzly bear in a prior life.). I’m more alert and awake to my surroundings because I like noticing the newly resurrected colors, smells and sounds. Below is a study of “Hope Springs Eternal” from a series of small abstraction paintings that I did in 2009 as a way to explore certain concepts about time (like the seasons), people and relationships, without using figurative imagery. Enjoy the extra hour of sunshine in your day. The first official day of Spring 2012 is March 20th…until next Sunday. 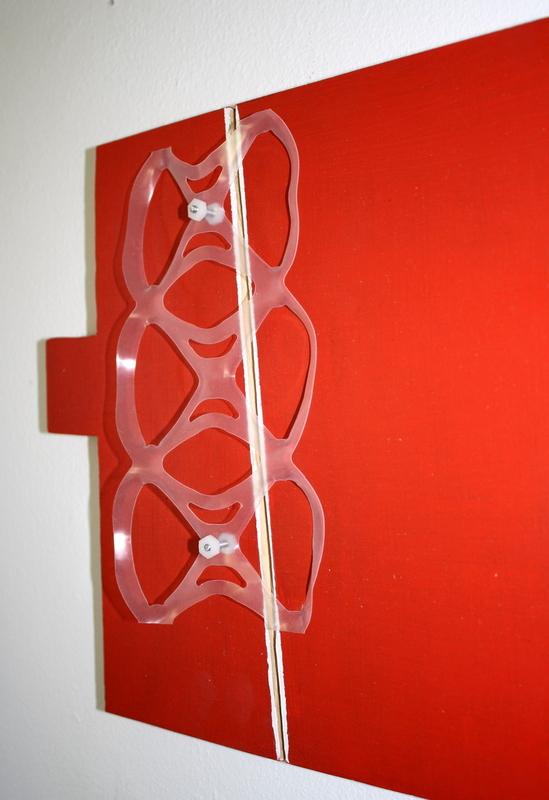 The most prosaic materials with a touch of “je ne sais quoi” can find a place on my studio walls, like the plastic six-pack rings and fabric netting that cushioned a shipment of holiday fruits. 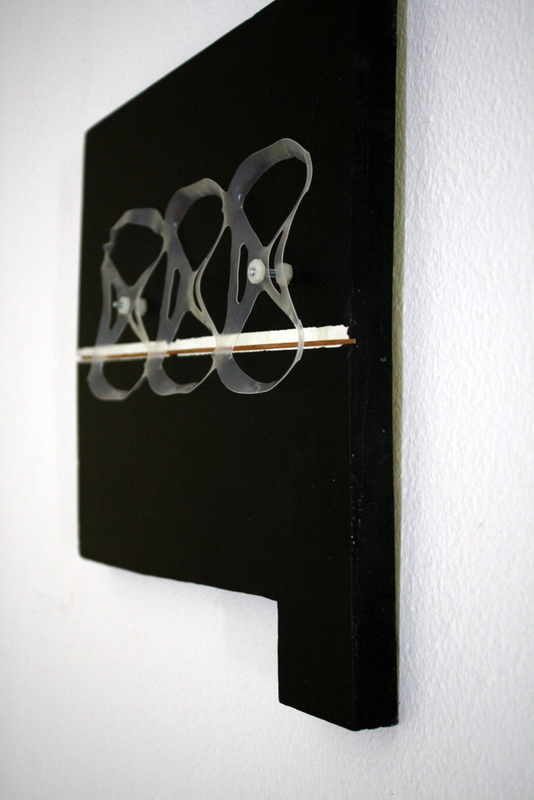 I lived with them hanging from this black clip for about a year wondering…. What appealed to me about the fruit packing material was its delicate quality. 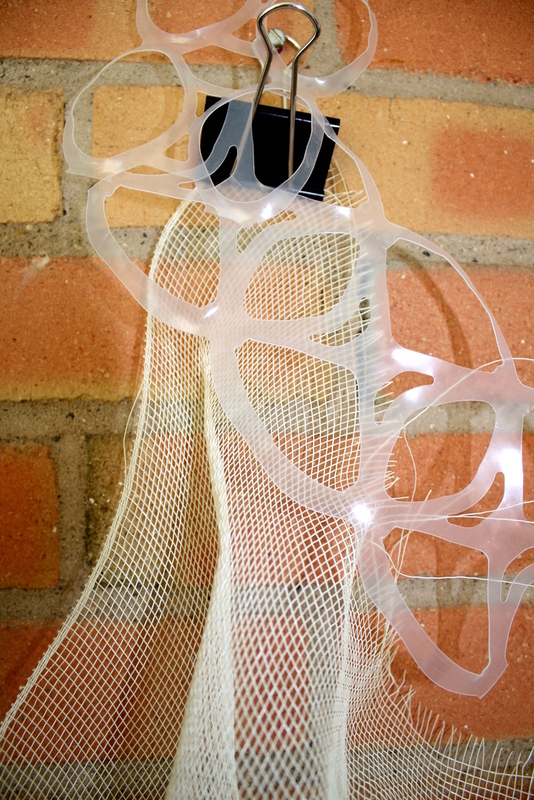 The transparency of the mesh made for another experiment with cast shadows. The wheat color was perfect against a dark brown surface. 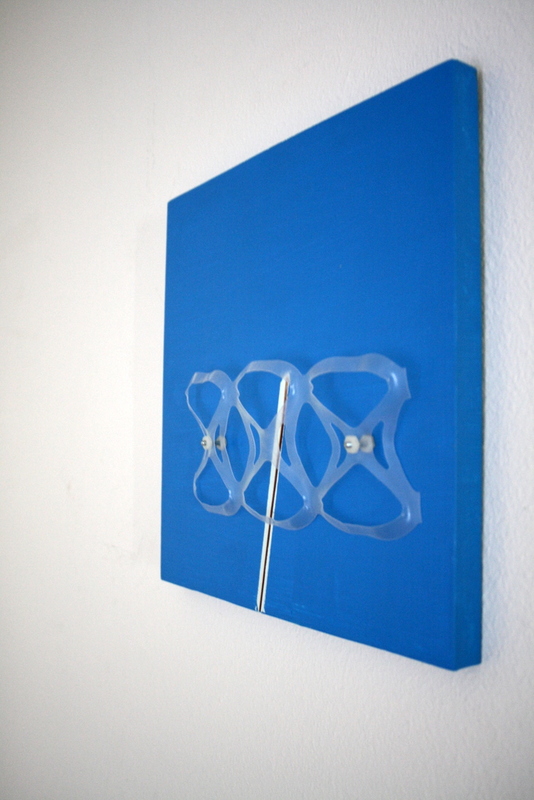 For “Save the Dolphins” and this piece named, “Quantum Wave,” the materials were suspended by using hardware-bought clear plastic nuts and metal bolts. The “Quantum Wave” when lit shimmers, yet the piece always has a 3-D wafer quality. As I’ve spent more time getting educated and learning about sculpture at the Nasher Sculpture Center, I’ve noticed that I have become more experimental with materials and some of my paintings, like these, are a hybrid of painting-sculpture. Notice the beauty in the ordinary and enjoy your week…until Sunday.